Pandit Jasraj is a famous Indian Classical vocalist. He is the foremost exponent of the Mewati Gharana of Hindustani classical music. Pandit Jasraj was born in 1930 to a musical family. At the age of six Pandit Jasraj was mesmerized by the soulful voice of the famous ghazal singer Begum Akhtar. He was initiated into vocal music by his father Pandit Motiramji. However, after the sudden demise of his father, Pandit Jasraj opted for the tabla under the training of Pandit Pratapnarayan, as an additional means of livelihood in order to lighten the burden of family responsibilities. But, at the age of fourteen as a rebellion against the humiliating treatment given to accompanying artists, young Jasraj vowed never to be an accompanist, and decided to sing. He took his vocal training under the guidance of his elder brother Pandit Muniram and Maharaja Jaywant Singhji Waghela. Pandit Jasraj is blessed with a rich, soulful and sonorous voice which traverses effortlessly over all three and a half octaves. The highlight of Pandit Jasraj's vocalizing is his perfect diction, clarity in sur and extreme tunefulness. Pandit Jasraj's greatest contribution to Indian music is his conception of an unique and novel jugalbandhi based on the ancient system of moorchanas, between a male and a female vocalist, each singing in their respective scales and different ragas at the same time. 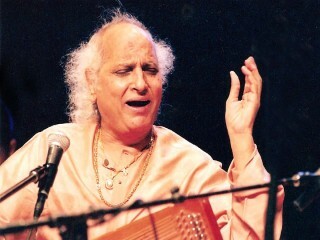 Pandit Jasraj is the recipient of several honors and awards. These include Padma Bhushan, Surer Guru , Sangeet Martand , Sangeet Kala Ratna, Sangeet Natak Academy Award , Maharashtra Gaurav Puraskar and Dinanath Mangeshkar Award.